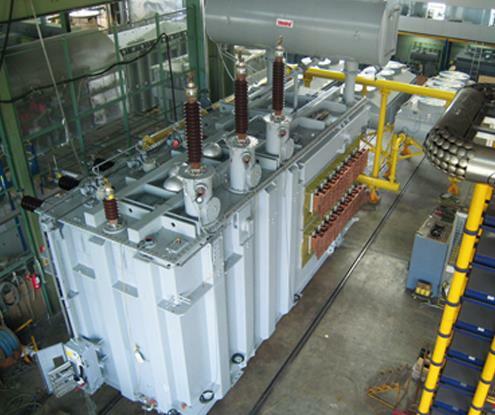 The rectifier transformer is the link between the electrical grid and the AC/DC converter. Therefore, it has the aim to provide the number of phases, the voltage shifts needed to realize the conversion and to adjust the rectifier input to vary the DC output voltage. To do it, the rectifier transformer is often coupled with components as regulating transformers (or autotransformers), saturable reactors and interphase transformers. All these components may be assembled in one or in separate tanks for transportation optimization and site restrictions. Rectifier transformers face high operating currents combined with a huge amount of harmonic content due to the distorted waveform caused by the semiconductor converters connected to the transformer. Typical applications are for: DC arc furnaces, electrolysis, scrap melting furnaces, aluminum smelter, graphitising furnaces, traction substations, metal refining and inverters for variable speed drives.